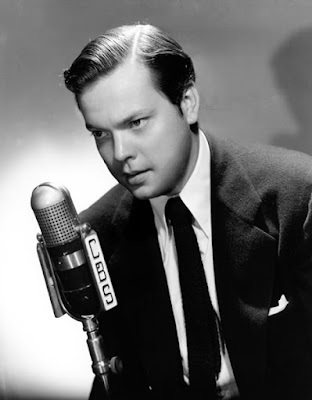 Between the period that he became a groundbreaking theater director and the period when he became a groundbreaking film director, Orson Welles was a groundbreaking radio director. Actually, these periods all overlapped in the mad days of the 1930s when Welles seemed to be everywhere, doing just about everything. His film work has, of course, seized the attention of the most people, if for no other reason than it is the work that's been most readily available to the public. His theater works, as all theater works, live on mostly in reports and stories and legends. (God, I'm pining for someone to put out a new exhaustive exploration of his theater work spanning from the 30s to the 60s.) For those interested in his radio work, however, there is wonderful news from Indiana University. The Lily Library in Bloomington, the guardian of the largest collection of Welles's papers and archival materials, has a magnificent new resource available to the public. Orson Welles On The Air collects much of Welles's prolific radio work as a director, actor, political commentator, and master of ceremonies. Included are the series' FIRST PERSON SINGULAR, MERCURY THEATER ON THE AIR, CAMPBELL PLAYHOUSE, THE ORSON WELLES SHOW, HELLO AMERICANS, ORSON WELLES COMMENTARIES, and more. Much more. It's fascinating to see Welles alternate between his roles as an entertainer (mounting a thrilling version of "Dracula" or his famous panic-inducing take on "War of the Worlds") to his work as a social critic (including his five episode campaign on ORSON WELLES COMMENTARIES calling for an investigation into the 1945 beating and blinding of an African American serviceman named Issac Woodard in South Carolina). Welles is back on the air where he belongs. Go check it out.